Beat flour into the eggs until a smooth paste is formed. Add the milk and butter slowly. Beat until batter is smooth with no lumps. Cook in a 10-inch non-stick pan over medium heat 2 ounces at a time. Brown on one side, flip over and brown on the other side. Stack the cooked crêpe s on top of each other on a large plate and wrap the stack with plastic when finished. This will steam the edges and make them more flexible when filling later. You can use them all at this time or freeze in stacks of 8 to 10 after wrapping well. Defrost in a microwave on low heat for 1 minute to use. Note: you can customize your crêpe flavor to match the type of filling you will be using. Additions of orange or lemon zest, vanilla and chopped herbs like parsley or chives are a few suggestions. In a large sauce pan, sauté the ground veal with 1 tblsp. olive oil over medium heat. Cook thoroughly without browning and remove to an 4 qt. bowl. In the same sauce pan add the remaining oil and sauté the onion over medium heat until translucent, about 3 minutes. Add the garlic and mushrooms and cook for 2 more minutes. Next add the spinach. Stir the spinach into the mixture a little at a time and cook until completely wilted. Add the contents of the sauté pan to the bowl of veal and mix in ricotta and seasonings. 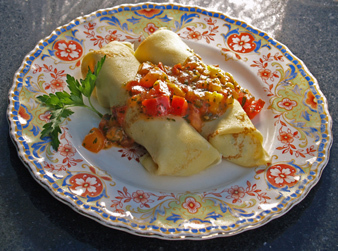 For each crêpe use 2 tablespoons of filling. Place filling at one corner of the crêpe and roll. Place filled crêpes on a cookie sheet. To heat, place in a preheated 350°F oven and warm for 5 minutes. Season the chicken with salt and roast for1 1/2 hrs. at 375°F as you normally would. In large heavy saucepan, bring plums, onions, water, ginger and garlic and red pepper to boil over medium heat; cover, reduce heat to low. Simmer, stirring occasionally until plums and onions are very tender, about 15 minutes. Remove the red bell pepper chunks and chop into 1/8 inch pieces to add to the finished sauce later. Puree sauce in a blender or with a stick blender. Return sauce to sauce pan and add sugar, vinegar, coriander, salt, cinnamon, pepper flakes, previously cooked diced red bell pepper and cloves. Bring to a simmer, stirring; reduce heat to low and reduce until mixture reaches consistency of applesauce, about 5 minutes. 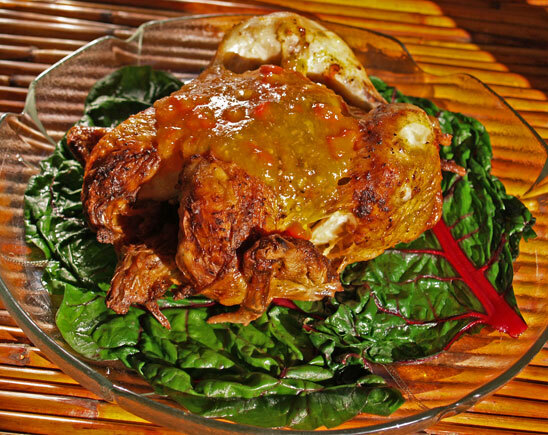 Place roasted chicken on wilted chard and pour sauce over. Serve some sauce on the side. Goes well with steamed rice. Chop tomatoes, in a food processor and add cheeses, lemon juice and salt. Remove to a bowl and add the avocado. Mash gently with a fork into the tomato cheese mixture until well blended. Lay out a few wonton skins and place 1 heaping tablespoon of the mixture in the center. Brush edges of bottom skin with a little water and top with another skin. Press edges well with your fingers to make a good seal. Lay out finished ravioli on a baking pan lined with wax paper. Do not let edges touch or they will stick together. Repeat until either the filling or wontons are used up. To cook boil in lightly simmering salted water taking care not to crowd. Cook for 3 minutes. Holding by the stems, blanch the Arugula in boiling water for 10 seconds then dip in ice water for 1 minute to cool. Cut off stems and gently squeeze dry. Sauté garlic for a few seconds taking care not to brown. Add all ingredients to a blender and puree for sixty seconds. 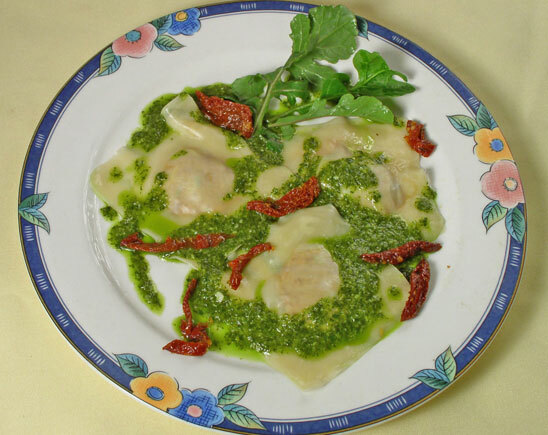 For each order of ravioli (4 for and appetizer or 6 for an entree) quickly heat 1 1?2 to 2 oz. of sauce in a sauté pan, add the ravioli to coat and arrange on a plate. Garnish with a few fresh Arugula leaves and julienned sun dried tomato slices.Makes 1 2/3 cups sauce enough for six to eight portions of ravioli. Preheat oven to 350°F. Cut squash in half and remove seeds. Cover a baking sheet with aluminum foil and brush with salad oil. Season cut sides of squash with salt and pepper. Place on cookie sheet and bake cut sides down for 45 to 60 minutes. A skewer should pierce the skin easily. Make enough rice in the meantime so that you have at least 2 cups. Mix the hot rice with walnuts, dates and maple syrup. Season the mix to taste. When the squash are done turn over and fill with the rice mixture. Return to oven, turn down to warm and hold there until dinner is served. 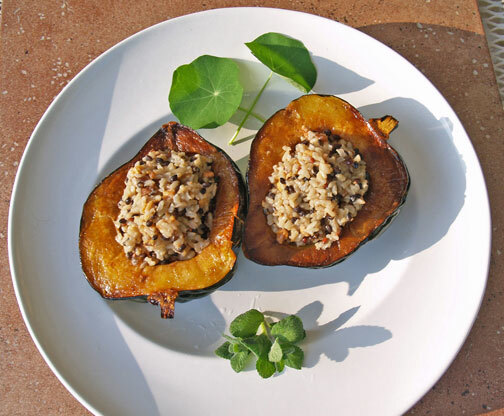 Squash can be baked the day before and reheated. Have your butcher butterfly the leg and make two flattish pieces. The shank part will make one and the thigh part will make another. Season the inside cut with salt and fresh ground pepper. Flatten each piece gently before stuffing. The veal will have an obvious grain of tissues running in one direction. Divide the filling on to the two pieces making stripes in the same direction as the grain. Roll the butterflied pieces so that the grain runs the length of the log. Tie with several loops of string and place on a roasting rack. Season the outside of the rolls with salt and pepper and roast at 350°F for 1 hour 10 minutes. Temperature should be 150°F in the center of leg pieces. Remove from oven. Cool and refrigerate over night. Before serving, using a pair of kitchen scissors cut the pieces of string and remove. (I also made a simple potato vinaigrette salad with some precooked and chilled red jacket potatoes by slicing them and tossing them with olive oil lemon juice, chopped parsley, salt and pepper. You could also serve pre-made deli made potato salad. I use curly leaf parsley for these recipes as it much more aromatic. Leave the rubber band on and blanch the parsley in boiling water for 1 minute and dip into ice water. Squeeze out as much of the water as possible. Chop off the stems and place the leaves in a blender with the oil and salt. Puree for 2 minutes. If puree is too thick add a little cold water. Preheat oven to 400°F. Dilute the mustard with water and brush the top side of the salmon filets with the mustard. Sprinkle with a small amount of kosher salt and the chopped parsley. Press the mustard coated side into the panko breadcrumbs and turn over and press the uncoated side into the crumbs. Heat the oil in a large non-stick pan with an oven - proof handle (a well cured cast iron skillet will do). Making sure the oil is not too hot to brown the crust, place the salmon, mustard coated side down, in the pan. Brown lightly for 1 minute and turn salmon filets over. Place pan into the oven for 5 minutes, remove and let the salmon remain in the pan to keep warm. Peel the celery root and grate into a bowl. Add the chopped onion. Peel and grate the potatoes into a separate bowl. Squeeze out extra moisture in the potatoes before adding to the bowl with the celery root. Add the eggs, nutmeg, and salt. Heat a nonstick Teflon pan or seasoned cast iron pan to medium high heat, add salad oil. Place a scant ¾ cup of the celery root mixture to one side of the pan then add one more batch of ¾ cup. Pancakes should be 3 ½ to 4 inches across and ½ inch in height. Brown lightly for 3 minutes and turn over. Brown for another 3 minutes and place on a cookie sheet. Repeat until mixture is used up. Bake pancakes for 15 minutes to cook through. These are also great for breakfast with eggs. Place warm pancake on plate. Place cooked salmon leaning against the pancake. 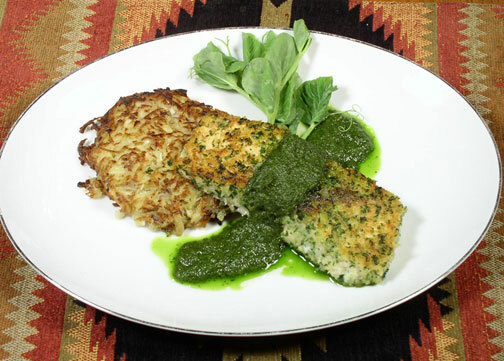 Drizzle with parsley puree. Serve with pea shoots or spinach. Mix warm water (90°F), sugar and yeast together in large bowl. Let proof for 5 minutes. Add remaining ingredients, mix until a ball forms - dough should be moist but not sticky. Kneed for 2 minutes by hand. Cover ball and let rise for 1 hour. 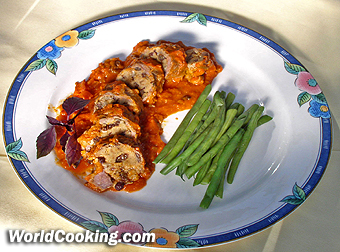 Braciole is commonplace throughout Italy, but very popular in the southern regions. The filling can have a variety of ingredients including: pine nuts, peppers and various dried fruits. Our family version of this recipe uses a tomato-based sauce to simmer the meat rolls in, while other versions may use beef stock. Using a large saucepan, slowly sauté the onion and garlic in olive oil. Add the currants, parsley and oregano. Add the white wine and cook together for 3 or 4 more minutes so that the flavors blend together. Drain off any excess oil and place the mixture in a large bowl. Blend in the breadcrumbs, cheese and eggs. Season with fresh ground pepper and add any salt that is needed. Cool the mixture. Pound the slices of beef between sheets of plastic wrap using a meat mallet. Take care not to tear the meat or plastic during this process. Divide the stuffing between each of the sheets of meat and roll. Tie the ends and middle of each roll gently with cotton string or carefully skewer with toothpicks to hold the rolls together. Season with a small amount of salt and pepper. Heat a small amount of light olive oil in a large sauté pan and brown each one carefully removing with a slotted spoon to an appropriate casserole dish. Pour off any excess oil from the sauté pan, add red wine to de-glaze, tomato sauce. Heat to a simmer and pour over the rolls. Cover with foil and bake at 350°F for 11/2 hours or until tender. Remove the rolls to a serving platter and remove the string or toothpicks. Pour the sauce over the Braciole just before service. Slowly saute vegetables and garlic in olive oil for 10 minutes. Vegetables may be chopped in a food processor as long as they are not liquefied. Add diced tomatoes (fresh vine ripe tomatoes may be used during the season) then add the pureed tomatoes. These may be chopped and thrown in a blender. Add seasonings, herbs and red wine. Simmer 2 hours over low heat. Season the prawns and half of the calamari tentacles with salt and pepper sauté them quickly a saucepot with 2 tblsp. of the olive oil. Cook until them until firm to the touch. Remove to a bowl and cool. Chop finely on a cutting board or in a food processor. Using the same pot and the remaining olive oil sauté the fennel, garlic and onion until translucent, do not brown. Remove half of the sautéed mixture to the bowl with the chopped cooked prawns and calamari tentacles. Add the bread crumbs, egg, half of the orange zest, half of the lemon zest, half of the parsley and mix well. Adjust seasoning with salt and pepper. To the pot with the remaining onion – fennel mixture add the tomato sauce, remaining zest, parsley and white wine. Cut the orange and lemon in half and squeeze the juice in to the pot. Simmer over low heat for 15 to 20 minutes. Using a small spoon or better yet disposable plastic pastry bag, fill each of the calamari tubes. 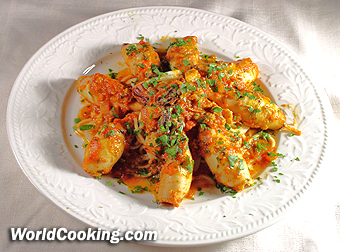 Arrange in a 6”x9” casserole pan with any remaining calamari tentacles and cover with the tomato sauce. Bake in a preheated 375°F oven for 20 minutes. Calamari should feel firm to the touch. Cook the pasta in plenty of salted boiling water until “al dente”, cooked but firm. Remove the cooked tubes to a warm plate and toss the pasta in some of the sauce remaining in the casserole dish. Place a bit of the pasta on each plate, top with calamari and tentacles. Spoon remaining sauce over the top of the calamari and serve. Line a 10 inch tart or pie pan with the pie dough. Poke holes in it with a fork and freeze for about 10 minutes before baking. Bake in a preheated 400°F oven until browned, about 12 minutes. Remove and let cool to room temperature. Whip the goat cheese, cream cheese and egg together until smooth. 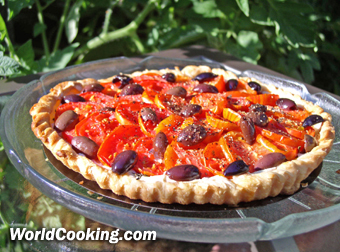 Spread over the cooked tart crust and bake at 375°F for about 15 minutes to “set” cheese mixture. 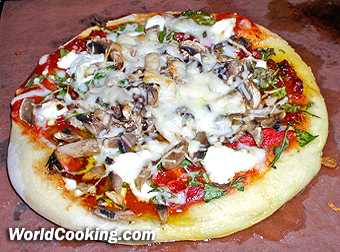 Remove from oven and top with basil. Slice the tomatoes into 1/8 inch slices and layer over the cheese mixture alternating colors if possible. Cut the olives in half and place randomly over the tomatoes. Sprinkle with fresh ground pepper. Return to 375°F oven for another ten minutes. Serve at room temperature. In a non-reactive saucepan, add the onion, ginger, sugar, vinegar, and apple juice. Reduce until syrupy. Take off of the heat and add the blueberries and sage. Preheat oven 400F. Break off the hard stems of the asparagus and slice at an angle very thin. Lightly spray a 2- quart casserole with vegetable spray. Arrange a layer of potatoes in casserole, then add some of the asparagus and salt. Continue to layer until all potatoes, asparagus and salt are used. Then pour cream over all. Cover with parchment paper that has been sprayed with vegetable spray then cover the paper with foil. Bake 20 min, then reduce heat to 350F and bake 1 hour or longer until tender when pierced with a toothpick. Remove coverings and top with cheese. Bake until cheese is lightly browned, about 5 minutes. Sauté or bake the chicken breasts until done. Cut a square of the gratin and place on a plate. 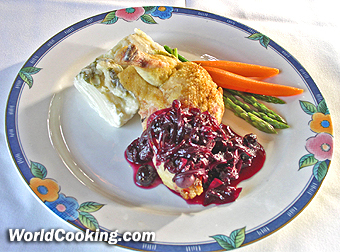 Top with chicken and spoon some of the compote over the chicken. 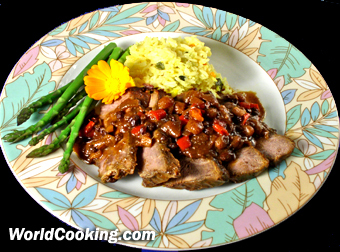 Serve with cooked peas and or carrots. Chop 2 large shallots (1/4 cup) very fine. Place in a non-reactive sauce pan (stainless, not aluminum). Peel, core and dice the pear finely. Add the chopped basil, vinegar and wine. Reduce simmering slowly. When most of the liquid is gone start adding the butter slowly while stirring with a wire whisk constantly. When the butter is all incorporated into the sauce put sauce pan in a warm, but not hot place. Enough for 4 servings. Preheat oven 400F. Slice fennel thinly. Lightly spray a 2- quart casserole with vegetable spray. In a bowl mix potatoes, fennel, cream and salt. Pour into the casserole and top with breadcrumbs. Cover with parchment paper that has been sprayed with vegetable spray then cover the paper with foil. Bake 20 min, then reduce heat to 350F and bake 1 hour or longer until tender when pierced with a toothpick. Remove coverings and bake until breadcrumbs are lightly browned, about 5 minutes. Scallops 6 to 7 ounces per person. Marinate scallops in a bowl with the soy sauce just before cooking. 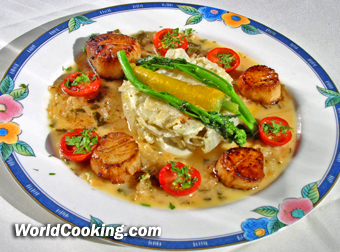 Heat 1 tablespoon oil a non-stick skillet and sear scallops a few at a time until browned and slightly firm when the sides are pinched. Keep warm in a low oven while assembling plates. Place a spoonful of the scalloped potatoes and fennel in the center of each warmed plate - top with cooked spinach or broccoli rabe. Spoon sauce around the potatoes and add the cooked scallops. Garnish with sautéed cherry. My smoked pork chop recipe originated while I was Chef at Trader Vic’s. I learned the basic techniques of meat and fish smoking from my Chinese chefs. We used the giant Chinese ovens for high temperature cooking and cool smoking. A mound of oak wood chips on a sheet pan was heated with an electric barbecue starter to create the smoke. Meats were hung inside and fish was placed on a grill at the top. Years later I discovered a better way to smoke by using an old converted refrigerator. A basic plan was found in a book on cooking techniques by Jacques Pepin. Since I had an old refrigerator the rest seemed simple, almost! Unlike todays plastic refrigerators, old refrigerators were made out of steel. Although this is essential to the conversion, it is very difficult and time consuming. However, today Le Marquis is blessed with a new smoker that my son Giorgio built. It originally was an oak cabernet sauvignon barrel. The cure for the pork chops is a combination of a smoked salmon dry cure ( brown sugar and kosher salt ) and cracked black pepper. Main Course! 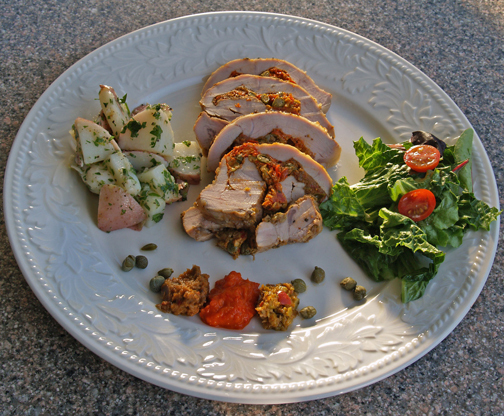 Main Course Recipes! World Cooking! International Recipes!